Happy Hump Day! This week has already been crazy because the twins first birthday party is this Saturday, and I've been running around like a mad woman trying to get things done. The second half of this week will be even busier, but I can't wait to have my family in town this weekend to celebrate the boys. I still can't get over the fact that they are going to be one year old so soon (July 3rd)! I hope you all aren't getting tired of seeing off-the-shoulder tops and white jeans! I just can't stop with the off-the-shoulder looks, and white jeans are my favorite to wear in the summer. They make a great alternative to denim, and I love how they can appear a little dressier than blue jeans. I chose my white skinnies to wear with this off-the-shoulder blouse because I love how they made the blue really pop, and balanced out the top's flowiness. For someone who doesn't normally wear a lot of color, I'm loving this purple bluish hue, and especially loving the embroidered detail on the bell sleeves. It's colorful, with out being overwhelming (for me, ha). I have a feeling this top will be on major repeat this summer, and can also see myself pairing it with my denim cut offs for an easy everyday look. This is such a cute look! 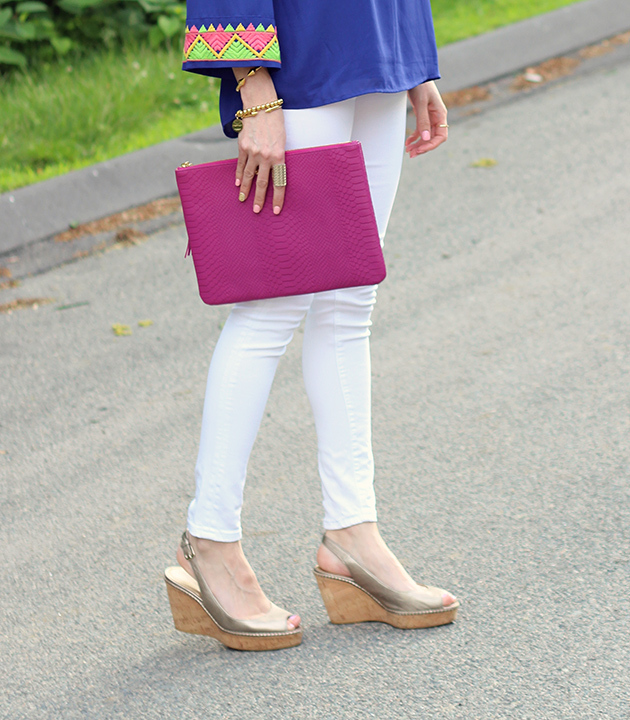 I am a huge fan of white jeans for summer too, they always look great! I'm stopping by from the WIWW Linkup! I love this. Especially the bright sleeves. That playful top is gorgeous and one a of a kind! Omg you look fabulous!! Those jeans are so amazing and perfect with that off the shoulder top! Love the blue with the white jeans. I don't know what we wore blue tops with before white jeans got popular. Enjoy your family this weekend! Sounds like it's going to be fun! 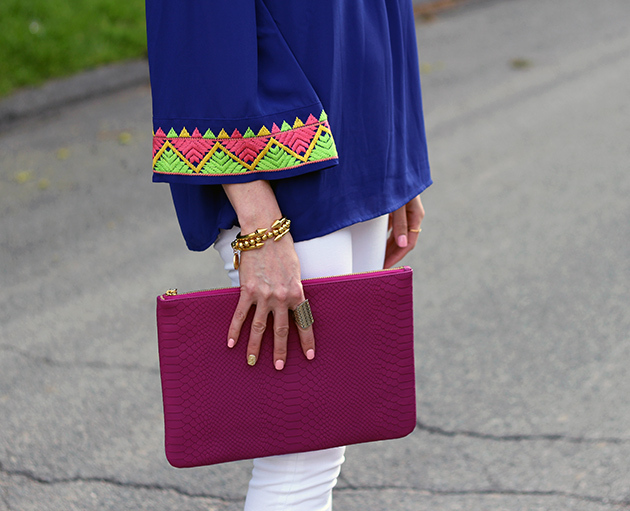 Obsessed with the neon details on the sleeves of your top! Adds a little extra something to an already great top!